Do you have a minute to spare to learn some English? 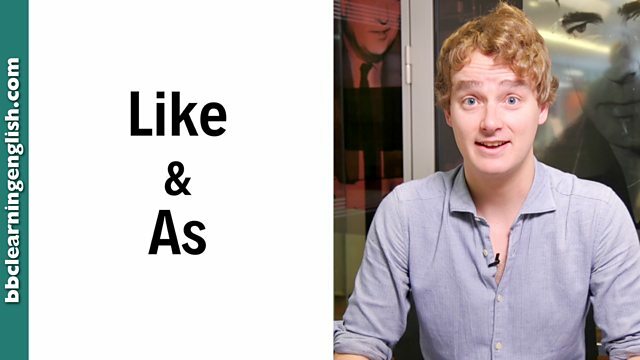 Tim tells it like it is, as only he can, about the difference between like and as! Give us 60 seconds and we'll give you the English! Hi! I'm Tim from BBC Learning English, here to tell you about two words we use to say that things are similar. We use like as a preposition before a noun or pronoun, and it means 'similar to'. He ran like the wind. Not: He ran as the wind. We use like, and not as, to compare appearances. This house looks like a castle. As can be used as a preposition. It means 'in the role of'. Dan, as your friend I have to say you're not a good singer. We often use as to talk about people's jobs. I work as an actor. Be careful using like and as because the meaning can change: As your brother, I'll try to help you means 'I actually am your brother'. Change it to like, and it means 'I'm not your brother but I want to act in a similar way'. Like is used as a preposition before a noun or pronoun. It means 'similar to'. We can use it to compare appearances (or other senses). That sounds like the bus. As can be used as a preposition. It means 'in the role of'. We often use it to talk about people's jobs. As your friend, I have to say you can't sing. I used my newspaper as an umbrella when it rained. I work as an actor. I've never produced a report as a journalist before. Which preposition do we use to talk about people's jobs? Complete this sentence: My brother works ______ a doctor in Australia. Which preposition do we use to talk about how something appears? Which of these sentences makes more sense?